There are many ways to stack wine, including stacking wines inside a wine cooler. I have written blogs on such items as wine storage and wine cellars, etc. in the past; Today I want to discuss stacking wine bottles in your storage area. There are several questions that need to be addressed before we can determine the stack-ability of your wine bottles. Questions such as how are the wines stored? Are they in cardboard boxes, wooden cases or are they individual bottles? Second: where are they going to be stored? Will the bottles be stored in wine coolers, a wine cellar or on wooden shelving? Let’s explore these questions. 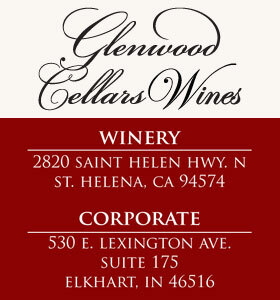 When I ship wine from our warehouse in Napa to Elkhart, the wine is stacked four to seven cases high on wooden pallets. Typically, there are 56 cases per pallet, four rows high of 14 cases. Many times, to save shipping costs, we will have five to seven rows high. We have also stacked individual cardboard cases six to seven cases high in our warehouse. To do this in your storage area is fine, just be sure when you get up to five cases high the cases are braced in some way. This prevents the cases from tipping over. 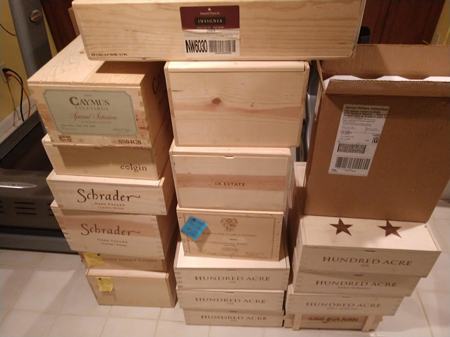 Keeping wine stacked in original wood cases is a good way to store wine, just make sure wine boxes are properly screwed together and don’t stack too high. Wooden wine cases are also stackable, much like cardboard cases. 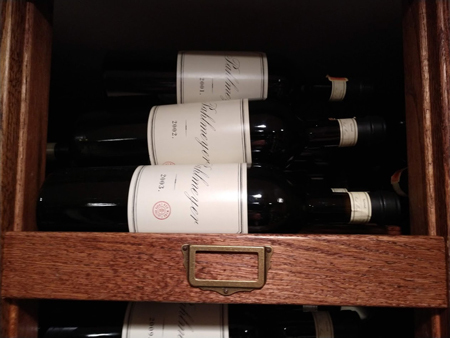 In my wine cellar at my home I generally stack wooden cases of wine in the center of the cellar. I stack the cases six to eight cases high and have had no difficulty with the stacks. A couple of things to remember: try to keep cases of similar sizes together. I generally keep the odd size cases together in separate stacks. Finally, if the wooden tops are unscrewed or gone entirely, be sure and keep those cases in the upper portion of your stack. The wooden cases aren’t quite as durable in this condition and on rare occasions could spread apart and cause the stack to fall. Typically wine coolers say they’ll hold a certain number of bottles, generally based on a 750-mL Bordeaux-sized bottle. Coolers, depending on their sizes, will hold 24 to 160 bottles. If you intend to store different size bottles such as Chardonnay or Pinot Noir you’ll get fewer bottles per shelf. Sometimes to reach the capacity of your storage unit it makes sense to remove a shelf, or even two, in your cooler to stack those different size bottles. If you do this I would recommend that you don’t stack bottles more than four levels per shelf. More than that could damage your cooler. I would also recommend that you start with two to three rows to see what the impact is on your shelves. Have they become hard to move or are they crooked? Storing wine in wooden shelves or bins in your cellar is another great way to store bottles. When you store your bottles on their sides in a wood rack be it “X” shape, square or any number of other shapes, how many bottles high or rows should you have? Once again it depends on the bottle shape. If you plan to store Cabernet and Chardonnay together you need to be careful in how they are stacked. 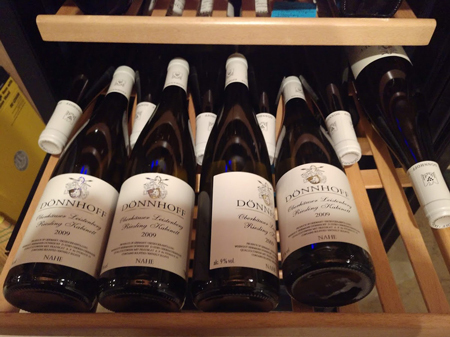 For example, it is best to rack bottles shaped similar to a Chardonnay or Pinot Noir bottle with bottle punt facing out into the room as opposed to cork out. This is necessary because the surface of glass available to stack on, with these styles of bottles, is less. The weight of the upper bottles (if not stacked just right) may cause a bottle to tilt and fall out of the shelf. With bottle punt facing out if there is any slippage the bottles will slide towards the back of the shelving, keeping the bottle from falling out of the storage area and breaking. I don’t think there is any danger of implosion by stacking bottles on top of each other (in the groove between two bottles side-by-side). I would suggest you not go more than 35 to 40 bottles per stack. In my home wine cellar the upper and lower shelves are designed to hold 24 to 36 bottles stacked on each other. In the end, like most things in life, it requires common sense and careful trial and error in determining the stack-ability of your wine. Certainly you wouldn’t want to lose a bottle or two due to slipping out of the stack and breaking on the floor. I enjoyed your November 2018 Stacking Wine Bottles blog while searching for answers on the subject. I have a question that several of my friends have been debating for quite some time and would love some expert advice please? Is there any risk of temperature transfer or anything of the sort while stacking wines on top of each other, in direct contact, that would be detrimental to ones collection? I recently was able to acquire two wonderfully designed display and storage racks from a local wine store however there are no dividers in the racks so the wines will indeed touch each other while being stacked on their sides. I would greatly appreciate your insight before doing any modifications on the racks to store and display my wines. Thank you very much for your note and support of my wine blog. To answer your question I believe there is not temperature transfer from one bottle to another that would effect the wine or damage it. The bigger question is where you are storing the wine and what the temperature is it in that area? Whatever the temperature is in the area you are storing the wine is what the bottle temperature will be. 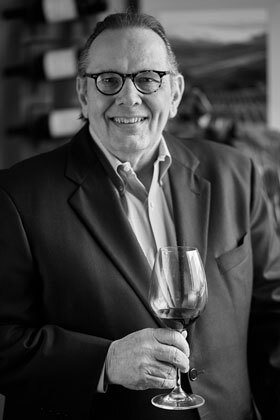 For example: in my wine cellar I keep the temperature at 55 degrees so all of the bottles in the cellar are the same temperature once they chill down to the room temperature. My bottles are stacked two to four bottles high and are pretty much the same temperature on the bottom row as they are on the top. If that wasn’t the case you would never be able to stack bottles. I believe that you can make any modifications to your wine racks that you need to without worry. Again the secret to keeping your wine collection safe and aging properly is to keep your wine in an area that is as close to 55 degrees as possible. 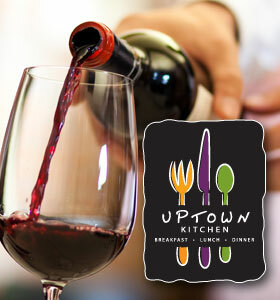 You never want the temperature of the wine to get over normal room temperature. I hope I have answered your question satisfactorily. If you have further questions please drop me a note and I will do my best to answer them.